O Teresa, whom the Church proposes to her children as a mistress and mother in the paths of the spiritual life, teach us this strong and true Christianity. From the blessed abode where thy love feeds upon infinite happiness, as it was nourished on earth by sufferings, obtain that thy native Spain may [again] carefully cherish, in these days of decadence, her beautiful title of the Catholic kingdom. Remember the part taken by France in determining thee to undertake the reform of Carmel. May thy sons be blessed with increase in members, in merit, and in holiness! Hear us, O God our Saviour; and, as we rejoice in this solemnity of blessed Teresa, thy virgin; so may our souls be improved by her heavenly instructions, and inflamed with the love of thee. Through our Lord Jesus Christ, thy Son, who liveth and reigneth with thee, in the unity of the Holy Ghost, God, world without end. Amen. Of Christian faith, or else to bleed. And she in pangs of love depart. From hell’s obscure and burning deep. Both now and for eternal days. Amen. Of this sovereign good of the Church militant and triumphant, Teresa, in a time of decadence, was commissioned to remind the world, from the height of Carmel restored by her to its pristine beauty. After the cold night of the fourteenth and fifteenth centuries, the example of her life possessed a power of irresistible attraction, which survives in her writings, drawing predestined souls after her in the footsteps of the divine Spouse. In this, as in all else, scholasticism followed the fathers. It asserted the doctrine concerning these summits of Christian life, even at a time when the weakness of faith in the people scarcely ever left full scope to divine charity, save in the obscurity of a few unknown cloisters. In its own peculiar form, the teaching of the School was unfortunately not accessible to all; and moreover the abnormal character of that troubled epoch affected even the mystics that still remained. It was then that the virgin of Avila appeared in the Catholic kingdom. Wonderfully gifted by grace and by nature, she experienced the resistances of the latter, as well as the calls of God, and the purifying delays and progressive triumphs of love; the Holy Ghost, who intended her to be a mistress in the Church, led her, if one may so speak, by the classical way of the favours He reserves for the perfect. Having arrived at the mountain of God, she described the road by which she had come, without any pretension but to obey him who commanded her in the name of the Lord. With exquisite simplicity and unconsciousness of self, she related the works accomplished for her Spouse; made over to her daughters the lessons of her own experience; and described the many mansions of that castle of the human soul, in the centre of which, he that can reach it will find the holy Trinity residing as in an anticipated heaven. No more was needed: withdrawn from speculative abstractions and restored to its sublime simplicity, Christian mysticism again attracted every mind; light reawakened love; the virtues flourished in the Church; and the baneful effects of heresy and its pretended reform were counteracted. As thou wilt, O Teresa: deliver thy soul; pass beyond that, and with Magdalene, at the recollection of what thou callest thine infidelities, water with thy tears the feet of our Lord, recognize thyself in St. Augustine’s confessions! Yes; in those former relations with the world, although approved by obedience; in those conversations, which were honourable and virtuous: it was a fault in thee, who wast called to something higher, to withheld from God so many hours which He was inwardly urging thee to reserve for Him alone. And who knows whither thy soul might have been led, hadst thou continued longer thus to wound thy Spouse? But we, whose tepidity can see nothing in thy ‘great sins’ but what would be perfection in many of us, have a right to appreciate, as the Church does, both thy life and thy writings; and to pray with her, on this joyful day of thy feast, that we may be nourished with thy heavenly doctrine and kindled with thy love of God. The Church thus abridges the life of the reformer of Carmel. The virgin Teresa was born at Avila in Spain, of parents illustrious for nobility and virtue. She was brought up by them in the fear of God; and while still very young, she gave admirable promise of her future sanctity. While reading the acts of the holy martyrs, she was so enkindled with the fire of the holy Spirit, that she ran away from home, resolved to cross over to Africa, and there to lay down her life for the glory of Jesus Christ and the salvation of souls. She was brought back by her uncle; but her heart still burned with the desire of martyrdom, which she endeavoured to satisfy by alms-deeds and other works of piety, weeping continually to see herself deprived of that happy lot. On the death of her mother she begged the blessed Virgin to be a mother to her; and she gained her request, for, ever afterwards the Mother of God cherished her as a daughter. In the twentieth year of her age she joined the nuns of St. Mary of Mount Carmel; and spent eighteen years in that monastery, enduring severe illnesses and many trials. While she was thus courageously battling in the ranks of Christian penance, she was deprived of the support of heavenly consolations, in which the saints usually abound even on this earth. She was adorned with angelic virtues; and her charity made her solicitous not for her own salvation alone, but for that of all mankind. Inspired by God, and with the approbation of Pius IV she restored the Carmelite rule to its primitive severity, and caused it to be thus observed first by the women and then by the men. The all-powerful blessing of our merciful God was evident in this work; for, though destitute of all human aid, and moreover opposed by many of the great ones of the world, the virgin was able, in her poverty, to build thirty-two monasteries. She wept continually over the blindness of infidels and heretics, and offered to God the voluntary maceration of her body to appease the divine anger, on their behalf. Her heart burned like a furnace of divine love; so that once she saw an angel piercing it with a fiery dart, and heard Christ say to her, taking her hand in his: Hence forward, as my true bride, thou shalt be zealous for mine honour. By our Lord’s advice, she made the exceedingly difficult vow, always to do what she conceived to be most perfect. She wrote many works, full of divine wisdom, which arouse in the minds of the faithful the desire of their heavenly country. Whereas Teresa was a pattern of every virtue, her desire of bodily mortification was most ardent; and in spite of the various maladies which afflicted her, she chastised her body with hairshirts and iron chains, scourged herself with sharp disciplines or with bundles of nettles, and sometimes rolled among thorns. She would often speak thus to God: O Lord, let me either suffer or die; for she considered that as long as she was absent from the fountain of life, she was dying daily and most miserably. She was remarkable for her gift of prophecy, and was enriched to such a degree by our Lord with his divine favours, that she would often beg him to set bounds to his gifts, and not to blot out the memory of her sins so speedily. Consumed by the irresistible fire of divine love rather than by disease, after receiving the last Sacraments, and exhorting her children to peace, charity, and religious observance, she expired at Alba, on the day she had foretold; and her most pure soul was seen ascending to God in the form of a dove. She died at the age of sixty-seven, in the year 1582, on the Ides of October according to the corrected Roman calendar (In order to effect this correction, Pope Gregory XIII had ordered that ten days of the year 1582 should be suppressed, and that the morrow of October 4 should be called the 15th of that month. It was during that historic night, between the 4th and 15th, that St. Teresa died). Jesus Christ was seen present at her death-bed, surrounded by angels; and a withered tree near her cell suddenly burst into blossom. Her body has remained incorrupt to the present day, distilling a fragrant liquor; and is honoured with pious veneration. She was made illustrious by miracles both before and after her death; and Gregory XV enrolled her among the saints. Another account of St. Teresa. The humble relation which St. Teresa has left us of her own life in obedience to her confessors, is the delight of devout persons, not on account of the revelations and visions there recorded, but because in it are laid down the most perfect maxims by which a soul is conducted in the paths of obedience, humility, and self-denial, and especially of prayer and an interior life. St. Teresa was born at Avila, in Old Castile, on the 28th of March, 1515. Her father, Alphonsus Sanchez, of Cepeda, was a gentleman of a good family, and had three children by a first wife, and nine by a second. The name of the latter was Beatrice Ahumada, mother to our saint, another daughter, and seven sons. Don Alphonsus delighted much in reading good books, with which he was well stocked; he was also very charitable to the poor, compassionate to the sick, and tender towards his servants; remarkable for his strict veracity, modesty, and chastity, and very averse from detraction and swearing. Our saint's mother, likewise, was very virtuous, suffered much from frequent sickness, and died happily at the age of three-and-thirty, when Teresa was twelve years old. By the means of the pious instructions and example of her parents, God inclined the tender heart of Teresa from her infancy to his service. Being only seven years old, she took great pleasure in reading the lives of the saints, and other pious books, in which she spent much time with a little brother, called Rodrigo, who was near of the same age. They were much amazed at the thought of eternity, and learned already to despise all that passes with time. With feeling sentiments they used to repeat often together, “For ever, for ever, for ever;” and admiring the victories of the saints, and the everlasting glory which they now possess, they said to one another, “What! for ever they shall see God.” The martyrs seemed to them to have bought heaven very cheap by their torments; and after many conferences together on this subject, they resolved to go into the country of the Moors, in hopes of dying for their faith. They set out privately with great fervour, praying as they went that God would inspire them with his holy love, that they might lay down their lives for Christ. But, upon the bridge over the Adaja, near the town, they were met by an uncle, and brought back to their mother, who was in the greatest frights, and had sent to seek them. They were chid by their parents for their unadvised project, and Rodrigo laid all the blame on his sister. Teresa continued the same course, and used often to say to herself, “O eternity! eternity! eternity!” She gave to the poor all the alms she could, though this was very little; and studied to do all the good works in her power. The saint and the same little brother formed a design to become hermits at home, and built themselves little hermitages with piles of stones in the garden, but could never finish them. Teresa sought to be much alone, and said very long prayers with great devotion, especially the Rosary; for her mother inspired her tender soul with a singular devotion to the Blessed Virgin. She had in her room a picture of our Saviour discoursing with the Samaritan woman at the well, with which she was much delighted, and she often addressed those words to our Saviour with great earnestness, “Lord, give me of that water;” meaning that of his grace and holy love. In the twelfth year of her age, upon the death of her mother, in great grief, she threw herself upon her knees before a picture of the Blessed Virgin, and besought her, with many tears, that she would vouchsafe to be her mother. The saint adds that this action, which she did with great simplicity, she thought afterwards very profitable to her; and found the Blessed Virgin favourable to her in all her re quests, and looked upon herself as much indebted to her intercession for the great mercy by which God was pleased to bring her back to a sense of her duty after she had begun to go astray. She aggravates exceedingly her own malice, by which she had been ungrateful to so great and so early favours she had received from God in her tender age; she never ceased to grieve that she should have ever defiled the tabernacle of her heart, in which he was to dwell for ever, and to thank his goodness for having called her back into the path of her duty, begging that he would be pleased to conduct her soul to eternal salvation. The most dangerous snare into which she fell was that of idle books, and vain company. Romances, or fabulous histories of knight-errantry, were at that time much in fashion in Spain. Teresa got hold of some such books a little before her mother died, and began to read them much more after her death, though always unknown to her father, who would have been highly provoked. About that time, a certain cousin-german, a worldly young woman, addicted to vanity, and fond of reading such books, began to visit her, and by her conversation wrought such a change in Teresa, that, forgetting the greatest part of her former devotions, she spent several hours both of the day and night in reading romances with great pleasure. She began at the same time to curl and trim her hair, to use perfumes, to love fine clothes, and the like, out of a desire of pleasing others, though without any bad intention; for she would not for the world have given to any one an occasion of offending God. She continued some years without imagining there was in this any sin; but she afterwards found it was a great one. None but this kinswoman and some other near relations were allowed by the father to visit his daughter; but even these proved dangerous company to her; and she listened to them with pleasure in their discourse on vanities, toys, and follies, never criminal, yet not good. Thus she gradually fell off from her fervour during three months. Her father perceived her to be much changed, and her devotion cooled. She laments grievously this her dangerous fall, and, from her own fatal experience, earnestly conjures all parents to watch over their children, that they may never fall into idle, vain, and dangerous company, or such books; for if she had not dashed against these two rocks, she thinks she should have always increased in fervour, instead of falling back. Her father took notice that her devotion was much cooled, and not being able handsomely to forbid this vain relation his house, he placed his daughter, who was then fifteen years of age, in a very regular convent of Austin nuns in Avila, where many young ladies of her quality were educated. Teresa found a separation from her companions grievous; but as her attachments proceeded only from the natural affectionate disposition of her heart, they were soon forgot, and a secret sentiment of honour and of her reputation made her disguise this repugnance. From the precaution which her father had taken, she saw that her fault had been greater than she imagined, and began severely to condemn herself for it. The first eight days in the convent seemed tedious to her; but having by that time forgot her former amusements, and broken the ties she had contracted in the world, she began to be pleased with her new situation. A devout nun, who was mistress of the pensioners, used frequently to instil into her mind serious reflections on virtue, and repeated often to her that dreadful truth, “Many are called but few are chosen.” By the discourse and counsels of this servant of God, Teresa recovered her fervour, and earnestly recommended herself to the prayers of the nuns, that God would place her in that state in which she might be likely to serve him best; though she had not then the courage to desire to be a nun herself, for the thoughts of a perpetual engagement affrighted her. After a year and half spent in this convent, the saint fell dangerously sick, and her father took her home. When she had recovered her health, she went to see her eldest sister in the country, who tenderly loved her; and calling to see an uncle, her father's brother, was detained by him some time. His name was Peter Sanchez, of Cepeda; he was a widower, and a very discreet and pious man. He lived retired in the country, where he employed his time in his devotions, and in reading good books. He gave several to Teresa to read, and his discourse was most commonly of God, and of the vanity of the world. When she returned to her father's house, she began for some time to deliberate with herself about embracing a religious state of life. She at first thought the convent of the Austin nuns, where she had lived, too severe, and was inclined to choose a house in which she had a particular great friend; by which circumstance she afterwards feared she had then more regard to the subtle gratification of a secret sensual satisfaction and vanity, than to the greater spiritual advancement of her soul. After a violent fever at home (for she had often bad health) she was determined, by reading St. Jerom's epistles, to become a nun. Her father would by no means give his consent; but said, that after his death, she might dispose of herself as she pleased. The saint, fearing from former experience she might again relapse, though she felt an excessive severe interior conflict in leaving her dear father, went privately to the convent of the Incarnation of the Carmelite nuns without the walls of Avila, where her great friend, sister Jane Suarez lived, though at that time she says she sought only the good of her soul, making no account at all of rest or ease. Upon her taking the habit, God changed the dryness under which she had laboured for some time into an extreme tenderness of devotion, and all her religious observances gave her great delight. Whilst she was sweeping the house, or employed in other such actions, the remembrance that she had formerly spent those hours in dressing herself, or in other vanities, overwhelmed her heart with such an extraordinary joy as amazed her. But during her novitiate she felt many severe interior trials, not-withstanding her constant great contentment in this state. She made her profession with extraordinary fervour in November, 1534, in the twentieth year of her age. A sickness, which seized her before her profession, increased very much on her after it, with frequent fits of fainting and swooning, and a violent pain at her heart, which sometimes deprived her of her senses. Physicians finding no remedy for her extraordinary case, her father got her removed out of her convent, in which the law of inclosure was not then established. Sister Jane Suarez bore her company, and she remained partly at her sister's in the country, and partly at Bazeda, almost a year in the hands of certain able physicians. Their medicines served only to increase her distempers, insomuch, that for the space of three months she suffered such excessive torments, with a continual burning fever, that her sinews began to shrink up, and she could take no rest either day or night. She was also oppressed with a profound sadness of mind. Her father after this caused her to be brought to his own house, where the physicians gave her over; for her distempers had then terminated in a hectic fever, and her sharp pains never left her, and afflicted her all over from head to foot. God, however gave her incredible patience; and she was much comforted by reading the book of Job, with St. Gregory's Morals, or Commentary, and had often in her mouth some of the aspirations of holy Job which expressed his resignation to God. She at length, in August, 1537, lay near four days in a trance, or lethargic coma, during which time it was expected that every moment would be her last. It being once imagined that she was dead, a grave was dug for her in the convent, and she would have been buried, if her father had not opposed it, and testified that he still perceived in her body certain symptoms of life. Through excess of pain she had bit her tongue in many places, when out of her senses; and for a considerable time she could not swallow so much as a drop of water without almost choking. Sometimes her whole body seemed as if the bones were disjointed in every part, and her head was in extreme disorder and pain. She could neither stir hand, nor foot, nor head, nor any other part, except, as she thought, one finger of her right hand. She was so sore that she could not bear any one to touch her in any part, and she had often a great loathing of all food. Her pains being somewhat abated, she so earnestly desired to return to her monastery that she was carried thither, though her body seemed reduced to skin and bone, and worse than dead through the pain she endured. She continued thus above eight months, and remained a cripple near three years. The paralytic disorder in which her fevers, violent headaches, and convulsions and contractions of her sinews had terminated, began so far to be abated, that she was able to crawl upon her hands and feet. After three years' suffering, she was perfectly restored to her health; and she afterwards understood that she had received of God this favour and many others, through the intercession of the glorious St. Joseph, which she had humbly and earnestly implored. She declares, that she trembled exceedingly, and praised and thanked the divine mercy with all the powers of her soul, as often as she remembered that “God might have bereaved her of life, when she was in a dangerous state; and I think,” says she, “I may safely add a thousand times, though I be blamed by him who commanded me to use moderation in the recital of my sins, I have disguised them enough. I beseech him for God's sake that he will not extenuate my faults; for by them the great goodness of God is more manifested, since he so long beareth an unfaithful soul. Praise be to Him for ever. May he rather annihilate me, than I should ever hereafter cease to love himself.” Her confessor, by whose order she wrote, knew her great propensity to magnify her faults; for which reason he gave her this charge. If, when she arrived at the most perfect purity of heart and divine love she could discern such faults and dangers in her soul, at a time whilst she seemed already a saint in the eyes of men, and received the gift of supernatural prayer, and other eminent virtues, how much ought we to fear in our lukewarm state, and excite ourselves to watchfulness and compunction? St. Teresa attributes the good opinion which others then had of her to her own cunning and hypocrisy, though she acknowledges that she was never designedly guilty of any dissimulation, having always abhorred such a baseness. Two great means by which she preserved her soul from many difficulties and snares were, her constant and tender charity and goodness towards all persons, by which she always gained the esteem and goodwill of all those with whom she lived or conversed; secondly, an extreme dread and abhorrence of the least shadow of detraction, insomuch that no one durst in the least reflect on any other person in her presence, and from her infancy she had had this rule always before her eyes, in discoursing of others to speak of them in the same manner she would desire others should speak of her. Who ought not always to tremble for himself, and excite himself by humility and holy fear to watch continually, with the utmost attention over his own heart, to apply himself with his whole strength to all his duties, and with the greatest earnestness to call in Omnipotence to his assistance, since this holy virgin, after receiving so many favours from God, fell again from her fervour and devotion? Her prudence and other amiable qualifications gained her the esteem of all that knew her. An affectionate and grateful disposition inclined her to make an obliging return to the civilities which others showed her. And, finding herself agreeable to company, she began to take delight in it, by which she lost that love of retirement which is the soul of a religious or interior life, and in which she had been accustomed to spend almost her whole time in prayer and pious reading. By an irregular custom of her convent she seemed authorized to indulge this dangerous inclination, and spent much time in conversing with seculars at the grate or door of the monastery, and she contracted an intimacy with one whose company was particularly dangerous to her. Such conversation, besides a great loss of time, dissipated her mind, and infused earthly affections and inclinations, which do infinite mischief to a soul whose affections are or ought to be spiritual, and expose her to the utmost dangers. Teresa therefore began to neglect mental prayer, and even persuaded herself that this was a part of humility, as her dissipated life rendered her unworthy to converse so much or so familiarly with God, by mental prayer. So subtle is the devil in his snares, knowing that no virtuous person can be deceived but under the appearance or cover of good. Teresa also said to herself there could be no danger or sin in what so many others did, more virtuous than she was, who received frequent visits of secular persons in the parlour. The remonstrances which a senior nun made to her on the impossibility of reconciling so much dissipation of mind and worldly conversation with the spirit and obligations of a religious life, were not sufficient to open her eyes. After twenty years thus spent in the imperfect exercise of prayer, and with many defects, the saint found a happy change in her soul. One day, going into the oratory, seeing a picture of our Saviour covered with wounds in his passion, she was exceedingly moved, so that she thought her very heart was ready to burst. Casting herself down near the picture, and pouring forth a flood of tears, she earnestly besought our Lord to strengthen her, that she might never more offend him. She had long been accustomed every night before she composed herself to rest, to think on our Lord's prayer in the garden and bloody sweat, and was particularly affected with that mystery. From this time she made the sufferings of Christ the ordinary object of her interior conversation with him during the day and night. Being particularly devoted to St. Mary Magdalen, she was delighted to place herself in spirit with her at the feet of Jesus, earnestly beseeching her Redeemer not to despise her tears. She always found particular comfort in those saints, who after having been sinners, were converted to our Lord, hoping that by their means he would forgive her as he had done them. Only this reflection discouraged her—that he called them but once, and they returned no more to sin, whereas she had so often relapsed; which afflicted her to the very heart, but the consideration of the love our Lord bore her, made her always confide entirely in his mercy. St. Austin, who was an admirable penitent, and the patron of the first nunnery in which she had lived, was one of those saints toward whom she was most tenderly affected. In reading his Confessions in the twentieth year of her age, she applied to herself that voice by which his conversion was wrought in so lively a manner as to remain for a considerable time even dissolved as it were in tears, with very great affliction and anguish; and she prayed with the greatest earnestness that our Lord would hear her cries, have regard to so many tears, and have compassion on her miseries. From that time she withdrew herself more than ever from all occasions of vain amusements and dissipations, and gave her time more entirely to the exercises of compunction and divine love. The saint had scarce formed her resolution of serving God perfectly, when he vouchsafed to visit her soul with new and extraordinary consolations and favours, regaling her with heavenly sweetness in great abundance; for she tells us he did not require, as in others, that she should have disposed herself for such favours, but only that she was content to receive them. “I never presumed,” says she, “to desire that he should give me so much as the least tenderness of devotion; I begged only for grace never to offend him, and for pardon of my past sins; and I never durst deliberately desire any spiritual delights. It was an infinite mercy that he would suffer me to appear in his presence. Only once in my whole life, being in great spiritual dryness, I desired him to afford me some little spiritual comfort; but as soon as I had reflected what I had done I was filled with confusion, and the grief I felt for my want of humility obtained for me that which I had presumed to beg.” The saint, before she gives an account of the supernatural favours she had received, conjures her confessor, Gardia de Toledo (by whose order and to whom she wrote this relation), entirely to conceal all she says on that head, and publish only her sins, imperfections, and the indifferent actions of her life. Describing the state of her soul with regard to her manner of prayer, she says she began to consider Christ as present in her soul, in the same manner as she had been accustomed to do after communion; thus she entertained herself with him in her ordinary actions, and in mental prayer. From the twentieth year after she had first applied herself to this exercise, she made little use of interior discoursing or reasoning to inflame her affections; the intuitive consideration of any motive or object immediately raising in her heart the most ardent acts of divine love, thanksgiving, compunction, or earnest supplications. The tenderness of her love, and her feeling sense of her own wants, formed her a prayer without studied or chosen words, or long reasoning and reflection in meditation. St. Teresa says she had been before accustomed to feel often a tender heavenly sweetness in her devotions; but at this time her soul began to be frequently raised by God to the sublimer degrees of supernatural passive prayer: for she observes that the servants of divine love, in which they chiefly advance by prayer, arrive not on a sudden at the highest degree of prayer. True love is a precious gift, and the soul must be more and more prepared and disposed as she advances. The gift of prayer and an interior life have difficulties to be overcome which cost much to flesh and blood, especially in the beginning or first steps by which a soul is prepared to receive it. St. Teresa, after having exercised herself twenty years in mental prayer, began to withdraw herself from the conversation of secular persons, and other occasions of dissipation and little faults which she exceedingly exaggerates, and was favoured by God very frequently with the prayer of Quiet, and also with that of Union, which latter sometimes continued a long time with great improvement of her soul, and with excessive heavenly joy and love. The examples of certain women who had been miserably the dupes of a deluded imagination and of the devil, much terrified her; and though she was persuaded her favours were from God, she was so much perplexed with these fears that she resolved to take advice: and she consulted so many persons, though obliging them to secresy, that the affair was divulged abroad to her great mortification and confusion. The first person to whom she opened herself was a gentleman of the town named Francis of Salsedo, a married man, who for thirty-eight years had practised mental prayer with great assiduity, and with his virtuous lady, who concurred with him in his great charities, fasts, and other exercises of piety, was an example of virtue to the whole country. This gentleman introduced to her Dr. Daza, a learned and virtuous priest; and after an examination, from what she declared of herself both judged her to be deluded by the devil, saying such divine favours were not consistent with a life so full of imperfections as she exposed hers to be. Her alarms being increased by this decision, the gentleman advised her to speak with one of those first fathers of the Society of Jesus, who were lately come into Spain, and were eminent for their manner of prayer, and their experience in virtue and an interior life. This gentleman (to whom the saint says she owed her salvation and her comfort) bade her not be discouraged, because she was not delivered from all her imperfections in one day; for God would do it by little and little, and said that he himself had remained whole years in reforming some very light things. By the means of certain friends one of these fathers of the Society visited her, to whom she made a very careful general confession, in which, with the confession of her sins, she gave him an account of all the particulars through the course of her whole life relating to her manner of prayer and her late extraordinary favours. The father assured her these were divine graces; but told her she had neglected to lay the true foundation of an interior life by the practice of an universal self-denial and mortification, by which a person learns to govern his senses, subdue entirely his passions, and cut off all inordinate attachments in the heart. That spiritual builder attempts to raise an edifice of devotion upon a quicksand, who does not begin by laying the foundation by humility and that spirit of compunction and practice of general self-denial, which being joined with a life of prayer will be a crucifixion of the old man, and a reformation of the affections of the soul. By the advice of this confessor, St. Teresa made every day a meditation on some part of our Lord's passion, and set herself heartily to practise some kinds of penance which were very inconsistent with her weak health; for on pretence of her great infirmities she had thought little of any other mortifications than such as were general. By the prudent order of the same servant of God, though he judged her extraordinary gusts in prayer to be from God, she endeavoured for two months to resist and reject them. But her resistance was in vain; and when she laboured the most to turn herself from heavenly communications, our Lord overwhelmed her most abundantly with them. St. Francis Borgia, at that time commissary-general of the Jesuits in Spain, coming to Avila, was desired to speak to the saint, and having heard her account of her prayer and state, he assured her without hesitation that the spirit of God was the author of her prayer; commended her resistance for a trial during the two months past, but advised her not to resist any elevations if our Lord was pleased to visit her so in prayer, provided she had no hand in endeavouring to procure them; and he prescribed her greater mortifications than she had hitherto undertaken. Her confessor being called away, she chose another of the Society of Jesus. This was F. Balthasar Alvarez du Paz, a very spiritual man, who, through severe interior trials during the space of twenty years, arrived at the perfection of holy contemplation and an interior life. This excellent director took notice of certain immortifications in the conduct of St. Teresa contrary to her perfect sanctification, especially in her remaining still sensible to the satisfaction of ingenious, witty, and learned conversation, of which he put her in mind. Her answer was, that she had hoped her motive in it had been always for the best, and that it seemed a kind of ingratitude in her, entirely to deny herself to certain friends. He told her she would do well to beg of God that he would direct her to do what was most pleasing to him, and for that purpose to recite every day the hymn Veni Creator Spiritus. She did so for a considerable time; and one day whilst she was reciting that hymn, she was favoured with a rapture, in which she heard these words, which were spoken to her in the most interior part of her soul: “I will not have thee hold conversation with men, but with angels.” She was exceedingly amazed at this voice, which was the first she heard in that manner: from that time she renounced all company but what business, or the direct service of God, obliged her to converse with. The saint had afterwards frequent experience of such interior speeches after raptures, and explains how they are even more distinct and clear than those which men hear with their corporal ears, and how they are also operative, producing in the soul the strongest impressions and sentiments of virtue, and filling her with an assurance of their truth, and with joy and peace; whereas, all the like illusions of the devil leave her much disquieted and disturbed, and produce no good effects, as she experienced two or three times. The saint earned these great heavenly comforts by severe sufferings; or rather God purified and improved her soul in his love and all virtues, both by his sweetest consolations, and the sharpest trials. She says of herself, under the name of a third person, what follows, “I know one who for these forty years (since God hath vouchsafed to honour her with special favours) hath not passed one day without anguish and various kinds of sufferings, besides sicknesses and great fatigues.” Whilst F. Balthasar Alvarez was her director, she suffered grievous persecutions for three years, and during two of them, extreme interior desolation of soul, intermixed with gleams of spiritual comfort and favours. It was her earnest desire that all her heavenly communications should be kept secret; but they were become the common subject of discourse in every conversation, and even in the public schools, and she was every where censured and ridiculed as an enthusiast or hypocrite: her confessor was persecuted on her account. Six religious men of note, who had been her friends, after a conference on this subject, decided that she seemed deluded by the devil, and prevailed on F. Balthasar to go with them to her, and to order her not to communicate so frequently (which was her greatest support and comfort), not to live so strictly retired, and not to prolong her meditations beyond the time prescribed by the rule of her house. Her very friends reviled and shunned her as one who had a communication with the devil, and some stuck not to call her a devil. F. Balthasar, indeed, bade her be of good courage; for if she was deluded by the devil, he could not hurt her, provided she laboured only to advance in charity, patience, humility, and all virtues. One day the saint, after having suffered a long and grievous desolation and affliction of spirit, suddenly fell into a rapture, and heard a voice interiorly saying to her, “Fear not, daughter, for it is I, and I will not forsake thee: do not fear.” Her mind was instantly quieted and composed, and filled with light; her soul was drowned in heavenly sweetness and joy; and being endued with strength and courage, she challenged the devils, making no more reckoning of them than of so many flies, and saying to herself that God, whose servant she desired to be, is all-powerful, and under his protection nothing could hurt her; and as she pretended and desired no other thing than to please him, she joyfully met all sufferings and renounced all ease and contentment, if she could only be so happy as to accomplish in all things his holy will. A confessor whom the saint made use of once during the absence of F. Balthasar told her that her prayer was an illusion, and commanded her when she saw any vision, to make the sign of the cross, and to insult the vision, as of a fiend. The saint assures us that these visions and raptures carried with them their own evidence and demonstration, so that whilst they continued, it was impossible for her to harbour the least doubt but they were from God. Nevertheless, she knew them to be subordinate to the ordinary means which God has established to conduct our souls to him; and as all pretended visions must be false and condemned which should contradict the scripture or the authority of the church, so no such visions can exempt us from any duty towards the church or others: for God never derogates, by private revelations, from his general laws and established rules. Therefore, in simplicity, she obeyed this order of her confessor; and the saint assures us that Christ himself in several visions approved her conduct in so doing. She adds, that in these visions to use some exterior action of scorn was a terrible thing to her, as she could not possibly believe but that it was God. “And I besought our Lord,” says she, “with much instance to free me from being deceived; and this I did continually, and with abundance of tears. I begged it also by the prayers of SS. Peter and Paul; because, as I had my first vision on their festival, our Lord told me they would take such care of me that I should not be deceived. Accordingly, I have often seen very clearly these two glorious saints, my very good patrons, upon my left hand. But this making signs of scorn when I saw the vision of our Lord, gave me excessive pain and trouble. For when I saw him present before my eyes, it was impossible for me to believe it was the devil. That I might not be perpetually crossing myself, I took a cross into my hands, and this I did almost always. I used not the signs of scorn often, for this afflicted me too much; and I remembered the affronts which the Jews put upon our Lord; and I humbly besought him to pardon me, since I did this in obedience to those whom he had appointed in his own place.—He bid me not be troubled at it, for I did well in obeying them; but he said he would bring them to understand the truth:” which they afterwards did. “When they forbade me the use of mental prayer, our Lord appeared angry at it, and bade me tell them this was tyranny. He also gave me reasons to know that this was not the devil. Once when I held in my hand the cross which was at the end of my beads, he took it into his hand; and when he gave it me again, it appeared to be of four great stones, incomparably more precious than diamonds.— A diamond is but a counterfeit in comparison of these. They had the five wounds of our Lord engraved upon them after a most curious manner. He told me I should always see this cross so, from that time forward, and so I did; for I no longer saw the matter of which the cross was made, but only those precious stones—though no other saw them but myself. When I was commanded to use this resistance to those favours, they increased much more, and I was never out of prayer. Even whilst I slept I was uttering amorous complaints to our Lord, and his love was still increased in me. Nor was it in my power to give over thinking on him, and least of all when I endeavoured at it. Yet I obeyed as well as I could, though I was able to do little or nothing in that respect. Our Lord never freed me from obeying them; yet he gave me all assurance that it was he, and instructed me what I should say to them. There grew in me so impetuous a love of God, that I found myself even dying through a desire to see him (my true life), nor did I know how or where to find this life but by death,” &c. Bishop Yepez informs us, that this cross fell afterwards into the hands of the saint's sister, Jane of Ahumada, who died at Alva, and he relates some miracles wrought by it. Pope Gregory XV, in the bull of the canonization of St. Teresa, commends this example of her obedience as the test of her spirit and of her visions, &c.: “By the command of her confessors, she humbly showed marks of contempt under the visions of our Lord, not without a great recompence of her obedience. She was wont to say, that she might be deceived in discerning visions and revelations, but could not in obeying superiors,” says this pope. Though after two years spent in frequent interior desolation, the visits of the Holy Ghost restored her interior peace with great sweetness and spiritual light, which dispelled her former darkness, she continued to suffer a whole year longer a persecution from her friends, which seemed general. F. Balthasar Alvarez, who was a spiritual man, but exceeding timorous, durst not oppose the torrent, or decide with confidence that the Holy Ghost was the author of the wonderful operations in her prayer, though he continued to hear her confessions, which scarce any other person in the country would have done; and he comforted her, saying, that so long as she improved herself in virtue, the devil could do her no prejudice. She had learned to be so perfectly dead to herself, that, with regard to herself, she was not the least concerned what the whole world said or did concerning her; but the judgment of others, as to her state, gave her still frequent great alarms and fears, which contributed both to purify her soul, and to prove more clearly her spirit of prayer. In 1559, St. Peter of Alcantara, commissary-general and visitor of the Franciscans, coming to Avila, conversed several days with St. Teresa. Few saints seem to have been more experienced in an interior life, or better versed in the supernatural gifts of prayer than this holy man. He discovered in Teresa the most certain marks of the wonderful graces of the Holy Ghost, expressed great compassion for her sufferings from the contradictions and slanders even of good men and learned doctors, and publicly declared, that except the truths of holy faith, nothing appeared to him more evident than that her soul was conducted by the spirit of God; but he foretold her that she was not come to an end of her persecutions and sufferings. The authority of this glorious saint, the reputation of whose judgment and sanctity gave his confident decision the greatest weight, turned the stream exceedingly in favour of the holy virgin. It is not to be expressed what comfort and advantage she received from the conversation of this holy man, who strongly recommended her defence and direction to F. Balthasar, at that time her ordinary confessor, though he was shortly after removed to another place. After the trials already made, and the judgment passed by St. Peter of Alcantara, not only F. Balthasar, but many other persons of the greatest piety, learning, and authority, declared confidently that the marks and reasons were most clear and convincing, that in her ecstasies and prayer, she was conducted in a supernatural manner by the Divine Spirit. Bishop Yepez relates, that the saint, when she was prioress of the convent of St. Joseph, at Avila, as she was going to receive the communion at the hands of the Bishop Don Alvarez of Mendoza, was raised in a rapture higher than the grate through which (as is usual in nunneries) she was to receive the holy communion; of which also sister Mary Baptist, prioress of Valladolid, was an eye-witness, with others. Likewise Bannes, a very learned theologian of the Order of St. Dominic, whose name is famous in the schools, and who was for some time confessor of St. Teresa, testified that the saint one day, in public, as she was raised in the air in the choir, held herself by some rails, and prayed thus, “Lord, suffer not, for such a favour, a wicked woman to pass for virtuous.” He mentions other instances in the public choir; but says, that at her earnest request, this never happened to her in public during the last fifteen years of her life. Richard of St. Victor teaches, that raptures arise from a vehement fire of divine love in the will, or from excessive spiritual joy, or from a beam of heavenly light darting upon the understanding. We learn from St. Teresa, that these three effects of an external grace usually concur in raptures. She says, the faculties or powers of the soul are lost by being most straightly united to God, so that she thought she neither saw, nor heard, nor perceived any thing about her; but this was only for a very short space during the highest part of some raptures: during the rest of the rapture, the soul, though she can do nothing of herself as to the exterior or the voluntary motions of the body, understands and hears things as if they were spoken from afar off. When she returns to herself, her powers continue in some degree absorbed sometimes for two or three days. In these raptures a soul clearly sees, and, as it were, feels how perfectly a nothing all earthly things are: how gross an error, and abominable a lie it is, to give the name of honour to what the world calls so: real honour being built on truth, not on a lie. A like idea she has of the vanity and folly of the love of money, and of the baseness of earthly pleasures; and she learns that nothing is really true but what conduces to virtue, and makes no account of any thing which brings us not nearer to God. The greatness and goodness of God, the excess of his love, the sweetness of his service, and such other great truths are placed in a great light, and made sensibly manifest to her—all which she understands with a clearness which can be no way expressed—the impression whereof remains afterwards in the soul. In the rapture she acquires also a liberty and dominion, which results from her perfect disengagement from creatures, upon which she looks down as raised above them, and above herself; and she is filled with confusion that she should have been so miserable as to have ever been entangled by them. She looks back upon her former blindness with amazement; and considers with compassion the misery of those who still remain in the like. But no effects of a rapture are so remarkable or profitable as the clear sight which the soul receives in it of her own imperfections, baseness, and nothingness; together with the most profound sentiments of humility, and, on the other side, a great knowledge of the goodness, majesty, and boundless power of God, with the most ardent love and desires of speedily possessing him for ever. Hence St. Teresa, when her soul was deeply wounded, and totally inflamed, as it were, by a spark falling from the immense fire of the love our Lord bore her, often repeated with incredible earnestness that verse: “As the hart panteth after the fountains of water, so panteth my soul after thee, O God.” (Ps, xlii. 1) Among the visions which the saint had of the joys of heaven, in one she saw her parents in bliss; in others, much greater secrets of that glorious kingdom were shown her, at which she remained amazed, and was ever after exceedingly moved entirely to despise all things below; but she found it impossible to give any description of the least part of what she saw, the brightness of the sun being mean and obscure in comparison of that light, which no human imagination can paint to itself, nor any of the other things which she then understood, and that with a sovereign delight, all the senses enjoying a superior degree of sweetness which cannot be declared. She remained once about an hour in that condition, and our Lord, showing most admirable things, said to her, “See what they lose who are against me; do not for bear to tell them of it.” “But, O Lord,” said the saint, “what good will my telling do them, whom their own malice blindeth, unless thou givest them light?” She adds, that the contempt of this world, and the desires of heaven with which these visions inspired her, could not be declared. “Hence, also,” says she, “I lost the fear of death, of which I had formerly a great apprehension.” Such was the value she learned to set upon the glory and happiness of loving and praising God in his eternal kingdom, that for the least degree of increase in it, she should have been most willing to suffer all that can be imagined to the end of the world, though to her, who deserved hell, the lowest place in heaven would be an infinite and most undeserved mercy. She sometimes saw the mystery of one God in three persons in so clear and wonderful manner, as much comforted and amazed her: sometimes Christ in the bosom of his Father, and frequently his humanity in its glorified state so beautiful and delightful, that she comprehended that to behold one glorified body, especially the adorable humanity of Christ, would alone be a great felicity. She often heard his Majesty say to her with demonstration of great love, “Thou shalt now be mine, and I am thine.” She was favoured with many visions in the holy Eucharist; and sometimes with apparitions of the Blessed Virgin, St. Joseph, and other saints; and frequently of angels of different orders standing near her, though she did not know their orders; for they never told her this. One of these visions she describes as follows: “I saw an angel very near me, towards my left side, in a corporal form (which is not usual with me; for though angels are often represented to me, it is only by the intellectual vision). This angel appeared rather little than big, and very beautiful; his face was so inflamed that he seemed to be one of those highest angels called seraphims, who seem to be all on fire with divine love. He had in his hand a long golden dart, and at the end of the point me thought there was a little fire; and I conceived that he thrust it several times through my heart after such a manner that it passed through my very bowels; and when he drew it out, me-thought it pulled them out with it, and left me wholly inflamed with a great love of God.” She says that this wound caused a great pain in her soul, which also affected her body; but this extremity of pain was accompanied with excessive delight, and whilst it continued, she went up and down like one transported, not caring to see or speak, but only to burn and be consumed with that pain, which was a greater happiness to her than any that can be found in created things. The saint's desire to die, that she might be speedily united to God, was tempered by her ardent desire to suffer for his love; and the excess of his love for her, and of the comforts which he so often afforded her, made her esteem it as of no account that she should desire to suffer afflictions for his sake. And she writes, “It seems to me there is no reason why I should live but only to suffer; and accordingly this is the thing which I beg with most affection of God. Sometimes I say to him with my whole heart, Lord, either to die, or to suffer, I beg no other thing for myself. It comforts me also to hear the clock strike; for so methinks I draw a little nearer to the seeing of God; since one hour more of my life is past.” The saint mentions several instances of persons of remarkable virtue, some in a secular, others in a religious state, of her own nunnery, and of several other Orders, whose souls she saw in visions freed from purgatory through the prayers of devout persons, and carried up to heaven, several hours or days after their departure; though their penitential and holy lives, their patience in long illnesses, their great regularity in their convent, and their tears, humility, and compunction at their death, which edified all who knew them, had persuaded her they would he admitted straight to glory. Besides the particular instances she relates, she adds she had seen the same of many others. “But among all the souls which I have seen, I have not known any one to have escaped purgatory, except three, F. Peter of Alcantara, a religious man of the Order of St. Dominic (F. Peter Ivagnez), and a Carmelite friar.” She was given to understand that this last was exempted from purgatory by the indulgences granted to those of his Order, he having been a religious man, and having faithfully observed his profession; “which,” she says, “I suppose was signified to me to imply, that more is required to make a religious man than the wearing of the habit,” namely, the spirit and faithful observance of this rule. Spiritual graces require this condition. All these visions and raptures tended exceedingly to the spiritual improvement of the saint in humility, divine love, and all other virtues. By them she was advertized of all her failings, and made continually more and more courageous, and perfect in the practice of all virtues; she learned that it is a misery, and a subject of patience, to converse in the world, to behold the comedy or puppet-show of this life, and to be employed in complying with the necessities of a mortal body by eating and sleeping, which captivate the mind, and are the occupation of our banishment from God. When she once grieved that all her Spanish pious books were taken from her, our Lord said to her, “Let not this trouble thee; I will give thee a living book.” This she experienced by mental prayer, and his heavenly communications. She learned by these raptures great heavenly mysteries, secrets, and things to come, which she foretold; and, as she assures us, not the least tittle of what was thus revealed to her ever failed to come to pass, though, at the time of her revelation and prediction, all appearances were contrary. She mentions that God, through her prayers, brought several sinners to repentance, and granted great graces to many others, as she learned by revelations. Also, that at her earnest request he restored sight to one that was almost quite blind, and health to some others labouring under painful and dangerous distempers. How perfectly she excelled in obedience appears from this circumstance, that on all occasions she preferred this virtue to her revelation, saying in them she might be deceived by the devil, but could not in obedience. In founding her convents and many other things, when she had received a command from Christ, she availed not herself hereof, but waited till by the rules of obedience, she was authorized to execute the divine commission, depending, however, steadfastly on him who promised or commanded the undertaking, that he would carry the same by the regular means into execution; in which she was never disappointed. F. Balthasar Alvarez said of her—“Do you see Teresa of Jesus? What sublime graces has she received of God! yet she is like the most tractable little child with regard to every thing I can say to her.” She called obedience the soul of a religious life, the short and sure road to perfect sanctity, the most powerful means to subject our will perfectly to that of God, and to overcome our passions, and which is the sacrifice of our whole lives to God. “I esteem it a greater grace,” said she, “to pass one day in humble obedience, putting forth sighs to God from a contrite and afflicted heart, than to spend several days in prayer. Is it nothing great to abandon in some sense the enjoyment of God in order to do his will manifested to us in obedience? Long prayer will not advance a soul at a time when she is called to obedience,” &c. She used often to repeat—“Obedience is put to the test in different commands.” All murmuring, excuses, or delays she condemns as contrary to obedience. As for her own part, even when superior, she studied by many contrivances to obey others, and always obeyed her confessor as she would have done God himself. A desire most perfectly to obey God in all things, moved her to make a vow never with full knowledge to commit a venial sin, and in every action to do what seemed to her most perfect; a vow which in persons less perfect, would be unlawful, because it would be an occasion of transgressions. Humility, the root of true obedience, and the fruitful parent of other virtues, was that in which she placed her strength, and her humility increased in proportion as she received from God the more extraordinary favours, which she saw to be his pure gifts, without her contributing any to them; and because she profited so little by them, she condemned and humbled herself the more. The virtues of others seemed to her more meritorious, and she conceived that there was not in the world one worse than herself. Hence she was the more inflamed to love and praise the gracious goodness of God, to whom alone she entirely ascribed his gifts, not usurping an atom of them to herself, and separating from them her infidelities and miseries, which was all that was of her own growth, and of which, by an infused light, she had the most extensive and fullest knowledge and the most sincere feeling. Hence, seated in the centre of her own baseness and unworthiness, she was always covered with confusion and shame in the divine presence, as a spouse blushing at the remembrance of her treasons and infidelities towards the best and greatest of lords and husbands. She sincerely looked upon herself as deserving every sort of disgrace and contempt, as one who deserved hell, and whose only support against despair was the infinite mercy of God; and she endeavoured to convince others of her wretchedness and grievous sinfulness with as great solicitude and affection as an ambitious proud man desires to pass for virtuous. There are many who affect to use this language of themselves, but cannot bear from others any contempt or injurious treatment. This St. Teresa received on all occasions with great inward joy, and exceedingly desired; and all honours and marks of esteem were most grievous to her. This satisfaction which the heart feels in its own just contempt is, as it were, the marrow and path of true humility, says Bishop Yepez. These dispositions were in her so perfect as to surprise above all other things those who were best acquainted with her interior, and are sufficiently discoverable in her writings. Nothing seems a clearer proof how perfectly our saint was dead to herself by sincere humility than the artless manner in which she constantly, and not in certain occasions only, speaks of herself with a view to debase herself in every thing. Her exterior conduct breathed this sincere disposition of her soul. Though superior and foundress she chose unaffectedly the greatest humiliations that could be practised in her order. If she pronounced a word in the divine office with a false accent, she prostrated herself in penance; confessed in chapter, and humbled herself for the least faults of inadvertence with surprising humility and alacrity, and underwent the most humbling penances in the refectory and elsewhere with the same. It was her pleasure to steal secretly into the choir after the office, to fold up the cloaks of the sisters, to choose for her part of work to sweep the most filthy places in the yard, and to perform the lowest offices in serving at table or in the kitchen, in which place she was often seen suddenly absorbed in God, with the utensils or instruments of her business in her hands; for every place was to her a sanctuary, and no employment hindered her from offering to God a continual sacrifice of humility and of ardent love and praise. Nothing is more admirable than the lessons of humility which she gives in her writings, and which she inculcates to her religious, recommending to them especially never to excuse themselves in faults, never to murmur, but to rejoice in abjection; never to justify themselves when accused falsely (unless charity or prudence make it necessary); to abhor every thought or mark of pre-eminence or distinction of ranks, which she extremely exaggerates as the bane of all true humility and virtue in a religious community, &c. It was her usual exhortation that, though we cannot arrive at the perfection of other virtues, or at a perfect imitation of our Blessed Redeemer, we can humble ourselves low enough and be ashamed to fall so far short of Christ, our model, in the cordial love of contempt, and in embracing humiliations, which he underwent for our sake, but which are our due and remedy. An eminent spirit of prayer, founded in sincere humility, and perfect selfdenial, was the great means by which God raised this holy virgin to such an heroic degree of sanctity. If she remained so long imperfect in virtue, and was slow in completing the victory over herself, it was because for some time she did not apply herself with a proportioned assiduity to the practice of devout prayer, some of her confessors having diverted her from it on account of her ill-health and exterior employments; which mistaken advice was to her of infinite prejudice, as she grievously laments. F. Balthasar Alvarez took much pains with very little progress for twenty years on the same account; and sister Gertrude Moor, the devout Benedictin nun, complains she had been led into the like false persuasion by directors unacquainted with the rules of an interior life. A right method of prayer replenished all the saints with a spirit of devotion which wrought a wonderful reformation of their affections, and changed their interior so as to make them on a sudden spiritual men. St. Teresa inculcates above all things in her writings the incomparable advantages of this spirit of prayer, and gives excellent lessons upon that important subject. Our divine Redeemer, and the mystery of his incarnation and death were a great object of her adoration and most tender devotion. She suggests this often as the most easy method for beginners to accustom themselves to the familiar use of aspirations, that they imagine themselves in spirit conversing with Christ, representing his humanity as present with them, whether by their side or in their heart. She observes that all religious persons are not called to contemplation, but all can use assiduous prayer with aspirations. It is a maxim which she strongly inculcates, that the most advanced ought not entirely to abandon the method of sometimes representing to themselves Christ as a man, and considering him as the object of their devotions, and this sometimes occupied her soul in her highest raptures. Her singular devotion to the holy sacrament of the altar appears in her works. She used to say that one communion is enough to enrich a soul with all spiritual treasures of grace and virtue, if she put no obstacles. To unite ourselves most frequently and most ardently with Christ in the holy Eucharist she called our greatest means of strength and comfort in our state of banishment till we shall be united to him in glory. Her ardour to approach the holy communion, and her joy and comfort in presence of the blessed sacrament are not to be expressed. In her most earnest prayers she conjured Almighty God, for the sake of his divine Son present on our altars, to stem the torrent of vice on earth, and preserve the world from those horrible profanations by which his mercy is insulted. This, her devotion, sprang from that inflamed love of God which all her actions and writings breathe. From the same source proceeded her burning zeal for the conversion of sinners, whose souls she continually recommended to the divine mercy with many tears, charging her religious never to cease from that office of charity, and from praying also for those ministers of God who labour for the salvation of souls. Her grief for the wicked was inexpressible, and she was ready to suffer with joy a thousand deaths for one soul. St. Teresa, burning with a desire to promote with her whole strength the greater sanctification of her own soul and that of others, and of labouring to secure by the most perfect penance her eternal salvation, concerted a project of establishing a reform in her Order. The rule which had been drawn up by Albert, patriarch of Jerusalem, was very austere; but in process of time several relaxations were introduced, and a mitigation of this Order was approved by a bull of Eugenius IV in 1431. In the convent of the Incarnation at Avila, in which the saint lived, other relaxations were tolerated, especially that of admitting too frequent visits of secular friends at the grate in the parlour or speak-house. St. Teresa one day expressing a great desire of living according to the original institute of the Order, her niece, Mary d'Ocampe, then a pensioner in that house, offered one thousand ducats to found a house for such a design, and a secular widow lady, Guyomar d'Ulloa, zealously encouraged the design; which was approved by St. Peter of Alcantara, St. Lewis Bertrand, and the Bishop of Avila, and the saint was commanded by Christ, in several visions und revelations which she recounts, to undertake the same, with assured promises of success and his divine protection. The lady Guyomar procured the licence and approbation of F. Angelo de Salazar, provincial of the Carmelites in those parts. No sooner had the project taken wind but he was obliged by the clamours which were raised against it, to recall his licence, and a furious storm fell upon the saint, through the violent opposition which was made by all her fellow nuns, the nobility, the magistrates, and the people. She suffered the most outrageous calumnies with perfect calmness of mind and silence, contenting herself with earnestly recommending to God his own work. In the meantime, F. Yvagnez, a Dominican, esteemed one of the most virtuous and learned men of that age, secretly encouraged the saint, and assisted Madam Guyomar to pursue the enterprise, together with Madam Jane of Ahumada, a married sister of the saint, who began with her husband to build a new convent at Avila, in 1561, but in such a manner that the world took it for a house intended for herself and her family. Their son, Gonzales, a little child, happened to be crushed by a wall which fell upon him in raising this building, and was carried without giving any signs of life to Teresa, who taking him in her arms, put up her ardent sighs to God, and after some minutes restored him perfectly sound to his mother, as was proved in the process of the saint's canonization. The child used afterwards often to tell his aunt that it was a duty incumbent on her to secure his salvation by her prayers and instructions, seeing it was owing to her that he was not long ago in heaven. After a most virtuous life, he died soon after St. Teresa, in extraordinary sentiments of piety. A great strong wall of this house falling in the night as soon as it was finished, many were discouraged; but the saint said it was the effect of the impotent rage and jealousy of the devil. The lady Louisa de la Cerda, sister to the Duke of Medina Celi, being in the deepest affliction for the loss of her husband, Count Arias Pardo, prevailed upon the provincial of the Carmelites to send an order to Teresa, at Avila, sixty miles from Toledo, to repair to her in that city. The saint remained in her house above half a year, and promoted exceedingly the spirit and practice of eminent virtue, not only with the lady, who had for her the highest veneration, but with her whole household and many other persons. All this time she abated nothing of her usual mortifications and devotions, and her provincial no sooner released her from the tie of obedience which he had imposed on her of living in the house of this lady, and left it to her choice either to go or stay, but she returned to her monastery of the Incarnation, at Avila. A little before she came back, at the time of the election of a prioress, several of the nuns were very desirous she should be chosen for that office, the very thought of which very much afflicted her; and though she was willing readily to endure any kind of torment for God, she could not prevail with herself to accept of this charge; for, besides the trouble in a numerous community, such as this was, and other reasons, she never loved to be in office, fearing it would greatly endanger her conscience. She, therefore, wrote to the nuns who were warmest for having her chosen, earnestly entreating them not to be so much her enemies. Our Lord, one day when she was thanking him that she was absent during the noise of the election, said to her in a vision, “Since thou desirest a cross, a heavy one is prepared for thee. Decline it not, for I will support thee: go courageously and speedily.” Fearing this cross was the office of prioress, she wept bitterly; but soon after heard that another person was chosen, for which she gave God most sincere thanks, and set out for Avila. The same evening that she arrived at Avila, the pope's brief for the erection of her new convent was brought thither. St. Peter of Alcantara, who happened to pass that way, Don Francisco de Salsedo (a pious gentleman with whom St. Peter lodged), and the famous Dr. Daza persuaded the bishop to concur, and the new monastery of St. Joseph was established by his authority, and made subject to him, on St. Bartholomew's day, in 1562, the blessed sacrament being placed in the church, and the saint's niece, who had given a thousand ducats, and three other novices, taking the habit. Hereupon a great noise was raised against the saint in the town; the prioress of the Incarnation sent for her from St. Joseph's, and the provincial being called, the saint was ordered to remain in her old monastery of the Incarnation, though they were somewhat pacified when the saint had clearly shown them that she had not taken the least step contrary to her rule, or against the duty of obedience. The governor and magistrates would have had the new monastery demolished, had not F. Bannes, the learned Dominican, dissuaded them from so hasty a resolution. Amidst the most violent slanders and persecutions the saint remained calm, recommending to God his own work, and was comforted by our Lord, who said to her in a vision, “Dost thou not know that I am Mighty? What dost thou fear? Be assured the monastery shall not be dissolved. I will accomplish all I have promised thee.” In the mean time, Don Francis of Salsedo, and other friends to the new establishment, deputed a very pious priest, named Gonzales de Aranda, to go to court to solicit in its favour, and at length all things were successfully concluded by a new brief from Rome, by which the foundation of the house without rents was confirmed, and towards the end of the year 1562, the bishop prevailed with the provincial to send Teresa to this new convent, whither she was followed by four fervent nuns from the old house. One of these was chosen prioress; but the bishop soon after obliged Teresa to take upon herself that charge, and her incomparable prudence in governing others appeared henceforward in her whole conduct. The mortification of the will and senses, and the exercise of assiduous prayer, were made the foundation of her rule: strict inclosure was established, with almost perpetual silence. The most austere poverty was an essential part of the rule, without any settled revenues; the nuns wore habits of coarse serge, and sandals instead of shoes, lay on straw, and never ate flesh. St. Teresa admitted to the habit several fervent virgins; but would not have above thirteen nuns in this house, for fear of dangers of relaxations and other inconveniences which are usually very great in numerous houses. In nunneries which should be founded with revenues, and not to subsist solely on alms, she afterwards allowed twenty to be received. But this regulation as to the number is not every where observed in this Order. The fervour of these holy nuns was such that the little convent of St. Joseph seemed a paradise of angels on earth, every one in it studying to copy the spirit of the great model before them. The general of the Order, John Baptist Rubeo, of Ravenna, who usually resided at Rome, coming into Spain and to Avila, in 1566, was infinitely charmed with the conversation and sanctity of the foundress, and with the wise regulations of the house, and he gave St. Teresa full authority to found other convents upon the same plan. At Toledo a young woman who had gained a reputation of virtue, petitioned to be admitted to the habit, but added, “I will bring with me my Bible.” “What!” said the saint, “your Bible? Do not come to us. We are poor women who know nothing but how to spin, and to do what we are bid.” By that word she discovered in the postulant an inclination to vanity, and dangerous curiosity and wrangling; and the extravagancies into which that woman afterwards fell justified her discernment and penetration. 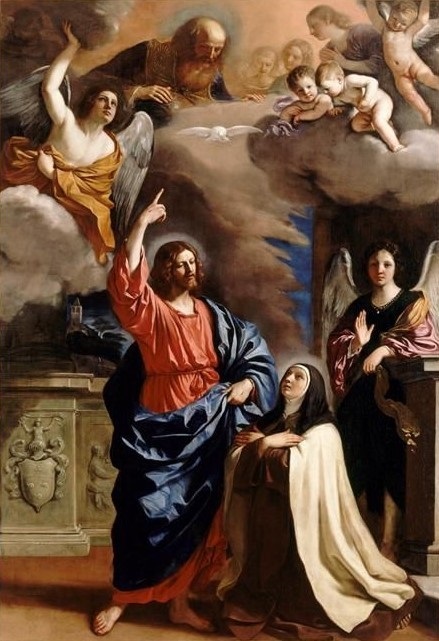 St. Teresa had met with two Carmelite friars at Medina del Campo, who were desirous to embrace her reform, F. Antony of Jesus, then prior there, and F. John of the Cross. As soon, therefore, as an opportunity offered itself, she founded a convent for religious men at a poor village called Durvelo, in 1568 (of which F. Antony was appointed prior), and, in 1569, a second for men at Pastrana, both in extreme poverty and austerity, especially the latter. After these two foundations St. Teresa left to St. John of the Cross the care of all other foundations that should be made for the religious men. At Pastrana she also established a convent for nuns. Prince Ruy Gomez de Sylva, a favourite courtier of Philip II, who had founded these convents at Pastrana, dying, his princess in the sudden excess of her grief made her religious profession in this nunnery; but when this passion abated claimed many exemptions, and would still maintain the dignity of princess; so that St. Teresa, finding she could not be brought to the humility of her profession, lest relaxations should be introduced into her Order, sent a precept to the nuns to leave that house to her, and retire to people a new convent in Segovia. Afterwards she would not easily admit ladies who had been long accustomed to rule. When Bishop Yepez entreated her once to admit to the habit a certain postulant, who was a lady of the first quality, advanced in years, and very rich both in money and vassalages, she would never hear of it, saying, that great ladies who have been long accustomed to have their own will, seldom sufficiently learn humility, obedience, and simplicity, without which they are more likely to overturn than to support a religious Order. In 1570 St. Teresa founded a convent at Salamanca, and another at Alva. Pope Pius V appointed apostolic visitors to inquire into relaxations in religious Orders, that they might be reformed. Dr. Peter Fernandez, a Dominican friar famous for his virtue and learning, was nominated visitor of the Carmelites in that part of Spain, and in the discharge of his office coming to Avila, he found great fault in the monastery of the Incarnation, in which were fourscore nuns, that inclosure and solitude were not better observed. To remedy these disorders he sent for St. Teresa, who had formerly consulted him in her doubts, and commanded her to take upon her the charge of prioress. It was a double affliction to the saint to be separated from her own dear daughters, and to be placed at the head of a house which opposed her reform with jealousy and warmth. The nuns also refused to obey her. She told them that she came not to command or instruct, but to serve and be instructed by the last amongst them. It was her custom to gain the hearts first before she laid her commands; and having by sweetness and humility won the affections of this whole community, she easily re-established discipline, shut up the parlours, and excluded the frequent visits of seculars. At the end of the three years of her superiority the nuns much desired to detain her, but she was appointed prioress of her reformed convent of St. Joseph in the same town. The provincial ejected St. John of the Cross and other fathers whom St. Teresa had appointed confessors to the house of the Incarnation, and involved her in the persecution he raised against them. St. Teresa felt most severely the persecutions which St. John of the Cross, F. Gratian, and others suffered; yet bore every thing with admirable patience and resignation, and wrote to the general with perfect submission and wonderful tranquillity and cheerfulness of mind. Bishop Yepez, who was at that time her spiritual director, was amazed at her constant joy, courage, meekness, and invincible greatness of soul under all manner of afflictions, and the most atrocious slanders with which even her chastity was attacked. In the mean time she did all the good offices in her power to every one of them that persecuted her, always spoke well of them, and would never hear the least sinister construction put upon any of their actions. She felt only the sufferings of others, being entirely insensible to her own. When FF. Gratian, Marian, and the rest gave up all for lost, she assured them, “We shall suffer, but the Order will stand.” The only answer she made to calumnies which were whispered against her was, “If they thoroughly knew me, they would say much worse things of me.” She told her persecuted friends that nothing seemed to her a surer mark of the divine mercy toward them, and that nothing is more advantageous or necessary than to suffer, that we may learn better to know both God and ourselves, and be assisted more perfectly to extirpate pride and the love of the world out of our hearts. “I return God a thousand thanks,” said she, writing to a friar of her Order, “and you ought also to thank him on my account. What greater pleasure can we enjoy than to suffer for so good a God! The cross is the secure and beaten road to lead our souls to him. Let us then love and embrace it. Woe to our reform, and woe to every one of us, if crosses fail us.” After recommending her undertaking with many tears to God for the honour of his divine name, she wrote to the king, imploring his protection; and his majesty, upon the information of certain Dominican friars of great reputation, warmly espoused her cause and that of her establishments; and an order was obtained at Rome to exempt the Reformed from the jurisdiction of the mitigated Carmelites, so that each should have their own provincials. This expedient satisfied both parties, and put an end to these troubles in 1577. Though the wonderful success of this saint in her enterprises undertaken for the divine honour, was owing to the blessing of God, and to the divine light and assistance which she drew down upon her actions by the spirit of holy prayer, the great channel of grace, she was certainly a person endowed with great natural talents. The most amiable sweetness and meekness of her temper, the affectionate tenderness of her heart, and the liveliness of her wit and imagination, poised with an uncommon maturity of judgment, gained her always in the first part of her life the particular love and esteem of all her acquaintance. Bishop Yepez assures us that her deportment in the latter part of her life was not less agreeable than it was edifying; and that the gravity, modesty, and discretion of her words and carriage had such a dignity and gracefulness, and such charms, that even her looks composed the hearts and regulated the manners of those who conversed with her. He adds, that her prudence and address were admirable. Such was her love of simplicity, truth, and sincerity, that if she heard any nun repeat something they had heard with ever so trifling an alteration in a single word, she reprimanded them with extreme severity; and often said, that a person could never arrive at perfection who was not a scrupulous lover of candour and truth. This appeared in all her dealings, and she would have rather suffered the most important affairs to miscarry, than to have said any word in which there could be the least shadow or danger of a lie or equivocation. St. Teresa, lived to see sixteen nunneries of her Reformed Order founded, and fourteen convents of Carmelite friars. St. Teresa was returning from founding a convent at Burgos to Avila, where she was prioress, when she was sent for by the Duchess of Alva. She was at that time very ill of her usual distemper of a palsy and frequent violent vomitings. Yet when she arrived at Alva, on the 20th of September, she conversed with the duchess several hours; then went to her convent in the town, understanding that our Lord called her to himself. On the 30th of that month she was seized with a bloody-flux, and after communicating at mass took to her bed, and never rose out of it any more. The duchess visited her every day, and would needs serve her with her own hands. Sister Anne of St. Bartholomew, the saint's individual companion, never left her. On the 1st of October, having passed almost the whole night in prayer, she made her confession to F. Antony of Jesus. He afterwards, in the presence of the nuns, entreated her to pray that God would not yet take her from them. She answered, she was no way needful to them nor useful in the world. She gave every day many wholesome instructions to her nuns with greater energy and tenderness than usual. She besought them for the love of God to observe their rules and constitutions with the utmost diligence, and not to consider the bad example such a sinner had given them, but to forgive her. The holy viaticum being brought into her chamber on the 3rd of October in the evening, she sprung up in her bed, though exceedingly weak, and among other fervent ejaculations, said, “O my Lord, and my spouse, the desired hour is now come. It is now time for me to depart hence. Thy will be done. The hour is at last come, wherein I shall pass out of this exile, and my soul shall enjoy in thy company what it hath so earnestly longed for.” At nine o'clock the same evening she desired and received extreme unction. F. Antony asked her if she would not be buried in her own convent at Avila? To which she answered, “Have I anything mine in this world? Or will they not afford me here a little earth?” She recited often certain verses of the “Miserere” psalm, especially those words, “A contrite and humble heart, O God, thou wilt not despise.” This she repeated till her speech failed her. After this she remained fourteen hours, as it were in a trance, holding a crucifix fast in her hand; and calmly expired at nine o'clock in the evening, on the 4th of October, 1582, the next day (by the reformation of the calendar made that year by cutting off those ten days) being reckoned the 15th, the day which was afterwards appointed for her festival. She lived sixty-seven years, six months, and seven days, of which she passed forty-seven in a religious state, and the latter twenty in the observance of her reformed rule. Her body was honourably buried at Alva; but three years after, by a decree of the provincial chapter of the Order, secretly taken up and removed to Avila in 1585. The Duke of Alva, resenting this translation, obtained an order at Rome that the relics should be restored to Alva, which was done in 1586, the body being always found entire, of the same colour, and the joints flexible. There it remains incorrupt to this day. St. Teresa was canonized by Gregory XV in 1621. The history of many miracles wrought by her relics and intercession may be seen in Yepez and in the acts of her canonization. St. Teresa having tasted so plentifully the sweetness of divine love, earnestly exhorts all others by penance and holy prayer to aspire to the same. She cries out, “O admirable benignity of thine, O my God, who permittest thyself to be looked upon by those eyes which have abused their sight so much as these of my soul have done! O great ingratitude of mortals! O you souls which have true faith, what blessings can you seek which may anyway be compared to the least of those which are obtained by the servants of God, even in this mortal life, besides the happy eternity hereafter! Consider it is most true that God even here gives himself to such as forsake all things else for the love of him. He is no excepter of persons; he loves all, nor hath any one an excuse, how wicked soever he hath been, since our Lord hath dealt with me so mercifully. Consider also that this which I am saying is not so much as a cypher of that which may be said. It is no way in my power to declare that which a soul finds in herself, when our Lord is pleased to impart to her these his secrets; a delight so highly superior to all that can possibly be imagined here, that with good reason it makes those who possess it abhor all the pleasures of the earth; which, all put together, are no more comparatively than mere dung and dirt; nay, it is loathsome to bring these into comparison at all with them, even though they might be enjoyed for ever. Yet of these celestial consolations, what kind of mean proportion is that which God is pleased to bestow in this world? No more than, as it were, one single drop of water of that great full-flowing river which is prepared for us. It is a shame, and I apply it to myself (and if it were possible for souls to be ashamed in heaven, I should be justly ashamed there more than any other), that we should desire such great blessings and infinite glory all at the cost of the good Jesus, and not weep at least over him with the daughters of Jerusalem. If we will not help him to carry the cross, O how can we ever think of coming to enjoy, by the way of pleasures, and pastimes, that which he purchased for us at the expense of so much blood! This can never be. We take quite a wrong course; we shall never arrive at our journey's end by such an erroneous way. Your reverence must cry out aloud to make these truths be heard. O how rich will he find himself another day, who left all the riches he had for Christ! How full of honour, who rejected all worldly honour, and took pleasure in seeing himself much debased and despised for the love of him! How wise will he see himself then who rejoiced to see the world hold him for a fool, since they called wisdom itself by that name!” &c.